So, we were sat around in the office a while back and chatting about the idea of Dyson releasing an electric car or other electric vehicle, as has been mooted for a number of years. We concluded that Sir James and his merry band of air-manipulating engineers would do no such thing. I mean, they couldn't successfully launch a washing machine. Was a move into the most cut-throat market in the world really likely? Well, it shows what we know. A Dyson EV is coming in 2020. Dyson is one of our favourite brands, for the quality and style of its products, and for the rage it seems to induce in professionally angry online halfwits. It's also not above a bit of media management – well, what big brand is? – and it's way of doing that on this occasion is to issue an email from Sir James Dyson to the Dyson email list. Whilst making clear nobody from Dyson will be doing any interviews whatsoever about it, for the time being. Well, fair enough. As Sir James' email says, "Competition for new technology in the automotive industry is fierce and we must do everything we can to keep the specifics of our vehicle confidential." So, until we hear anything more concrete, here's the email. 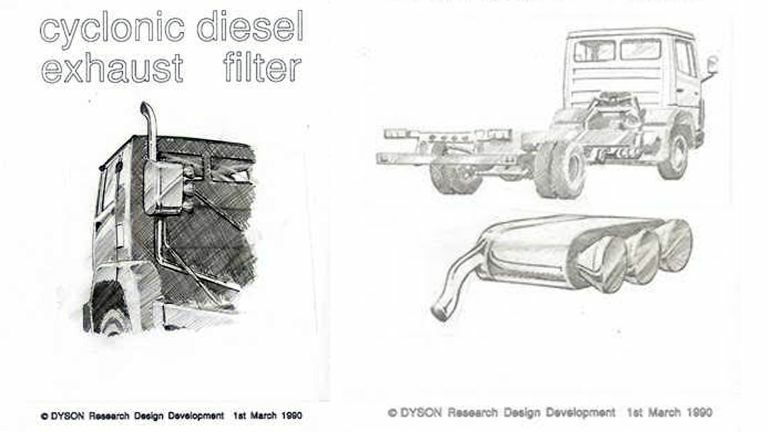 You may note that the sketches related to the original Dyson pollution-fighting mission all relate to lorries. However, you may also note that recent Dyson vehicle-related hirings have been from Tesla and Aston Martin, and draw your own conclusions from that. Dyson claims the EV team "is already over 400 strong, and we are recruiting aggressively," and has "committed to investing £2bn on this endeavour." We're going to assume any future Dyson EV won't be made of purple and silver metal, with translucent plastic bits. In fact, after being proved so comprehensively wrong on an EV's mere existence, we're not going to assume anything, ever again. "In 1988 I read a paper by the US National Institute for Occupational Safety and Health, linking the exhaust from diesel engines to premature death in laboratory mice and rats. In March 1990 a team at Dyson began work on a cyclonic filter that could be fitted on a vehicle’s exhaust system to trap particulates. "Dyson has begun work on a battery electric vehicle, due to be launched by 2020." "We’ve started building an exceptional team that combines top Dyson engineers with talented individuals from the automotive industry. The team is already over 400 strong, and we are recruiting aggressively. I’m committed to investing £2bn on this endeavour. The project will grow quickly from here but at this stage we will not release any information. In London, nearly 9,500 people die early each year due to long-term exposure to air pollution, according to a study carried out by researchers at King’s College London. The World Health Organisation reports “in 2012 around 7 million people died – one in eight of total global deaths – as a result of air pollution exposure”. It is our obligation to offer a solution to the world’s largest single environmental risk. I look forward to showing you all what I hope will be something quite unique and better, in due course!